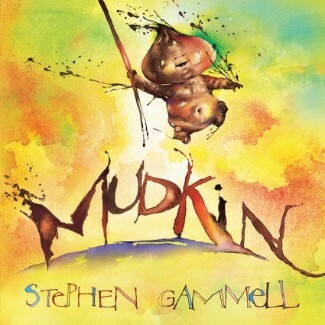 Mudkin is a book of few words, relying on the wonderfully illustrated pictures to tell the tale of a young girl playing in the puddles after it rains. The rain is gone and the queen commands that everyone plays, well, she's not really a queen but in her imagination she meets a friendly little mud baby who creates for her a crown and a cape and takes her to the meet her subjects in the Mudkin's kingdom. Playing in the rain puddles and the mud can be fun and the young lady takes us on a fantastical journey through the mud and the rain to meet the people that live there. The more it rains, the more people arrive to greet her and when the rain goes away, she calls it a day and returns home from her playing. I think little children just starting to look at books would enjoy this story, with few words to discourage them, they are able to explore their imagination as they view its pages and wonder what life is like in the land of the Mudkins. "Rain's gone! Time to play!" commands the queen. Well, she's not really a queen - just an ordinary girl who has an extraordinary day. She meets Mudkin, a friendly creature who whips up a robe and crown for her. Away they go to meet Her Majesty's subjects. Even if the kingdom lasts only until the next rain shower, the crown Mudkin gives her is forever.